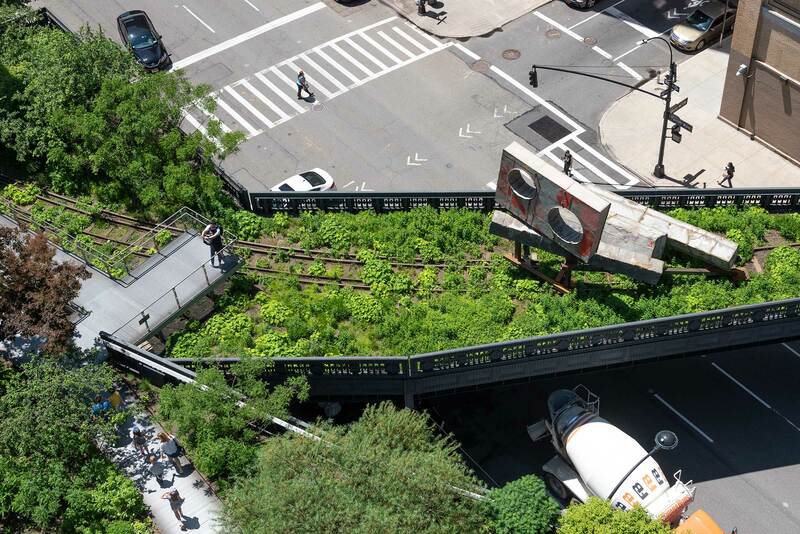 High Line Art is dedicated to expanding the role of contemporary art in public spaces. 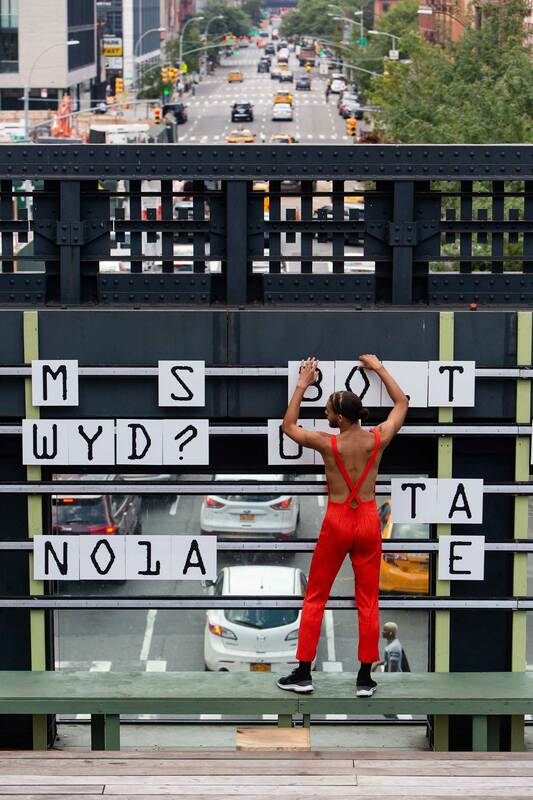 We commission and produce world-class art projects on and around the High Line, sparking the dialogue that is an essential element of city life. For the inaugural High Line Plinth, Simone Leigh presents Brick House, a sixteen-foot-tall bronze bust of a black woman whose torso is conflated with the forms of a skirt and a clay house. Opening in April, En Plein Air is a group exhibition that broadens and challenges the tradition of outdoor painting. A group video exhibition that looks at the absurd ways humans divide up the world across bodies of water. Dorothy Iannone presents her first public artwork in the form of a mural depicting three colorful Statues of Liberty. The High Line Network’s first Joint Art Initiative, spanning 5 cities across North America, features 25 proposals for new monuments. For the first High Line Originals film, Tourmaline presents Salacia, a short about Mary Jones, a 19th-century Black trans New Yorker as she discovers her power in the face of heightened systemic racism and transphobia. 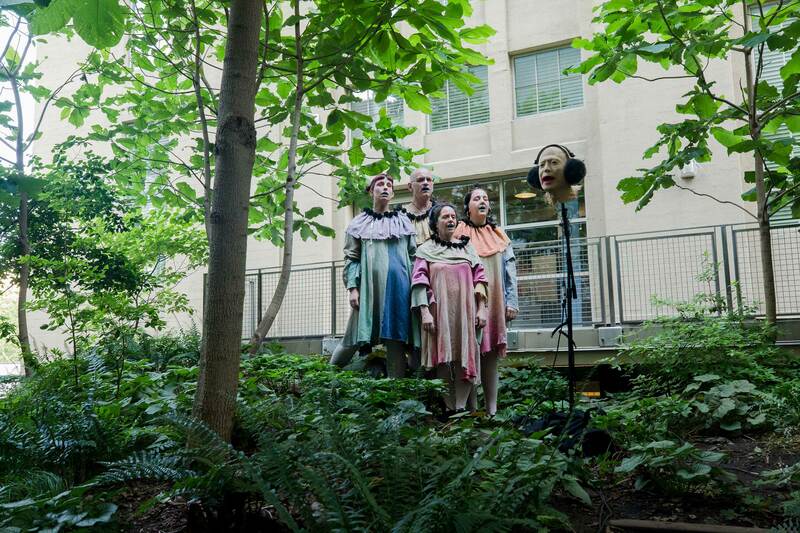 The High Line is the only park in New York City with a dedicated multimedia contemporary art program, which we offer to audiences, rain or shine, 365 days a year—all for free. We present works by national and international artists at varying stages of their careers, from emerging voices to those long established. Led by Cecilia Alemani, the Donald R. Mullen, Jr. Director & Chief Curator, High Line Art invites artists to engage with the unique architecture, history, and design of the High Line in creative and provocative ways. Through art, we foster a productive dialogue with the surrounding neighborhood and urban landscape. You can follow High Line Art on Instagram, Twitter, Facebook, and Tumblr. You can be the first to hear about new and amazing artworks coming to the High Line. Sign up for the High Line Art newsletter. 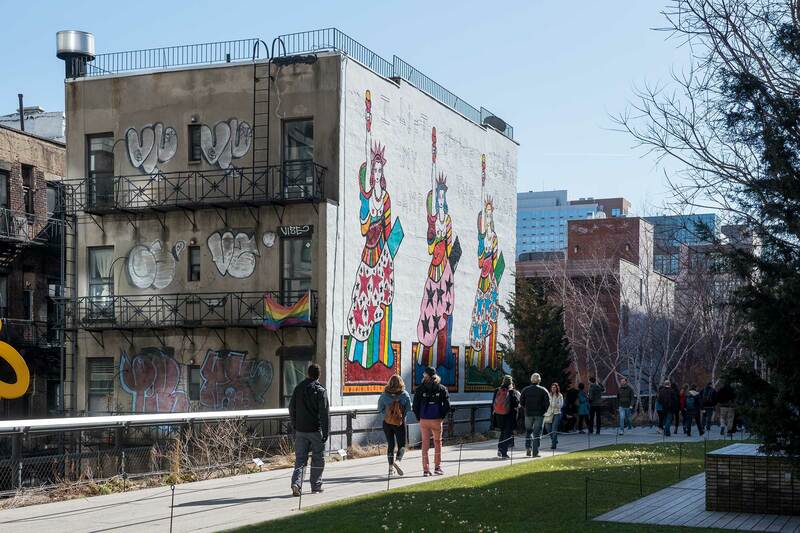 We work with world-renowned artists to commission temporary, site-specific sculptures, installations, and murals that are visible from the High Line and the surrounding neighborhood. Everyday at dusk, on the High Line at 14th St., we screen a rotating selection of video art, including both new and historic works. Proceeds from the annual High Line Art Dinner, featuring sunset cocktails and an intimate seated meal in the Chelsea Market Passage, help us sustain our public art program. 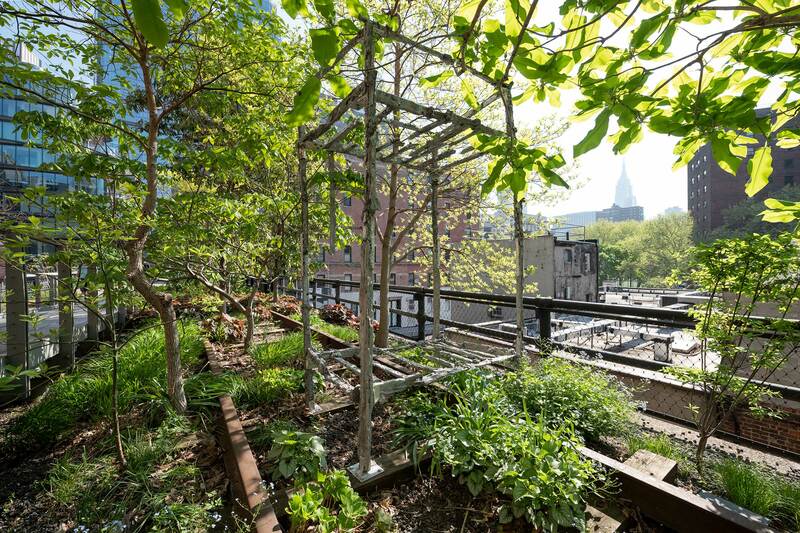 You can power the arts by supporting the High Line. With your tax-deductible donation, you’ll help us make world-class contemporary artworks free and open for everyone. There’s always something new to experience on the High Line, from dance to meditation to civic engagement to family events. Check out what’s happening this month. Lead support for High Line Art comes from Amanda and Don Mullen. Major support for High Line Art is provided by Shelley Fox Aarons and Philip E. Aarons, The Brown Foundation, Inc. of Houston, and Charina Endowment Fund. High Line Art is supported, in part, with public funds from the New York State Council on the Arts with the support of Governor Andrew Cuomo and the New York State Legislature, and from the New York City Department of Cultural Affairs in partnership with the New York City Council, under the leadership of Speaker Corey Johnson. En Plein Air is supported, in part, by an award from the National Endowment for the Arts. Dorothy Iannone, I Lift My Lamp Beside the Golden Door, is made possible, in part, by an in-kind donation from Morgenstern Capital and Canvas Property Group. Additional in-kind support is provided by Colossal Media.